Hire Children’s Entertainers with a focus on Live Music. Entertainment for Kids using live music as the focus is special and kids remember the party. The Bananas are a unique group of musicians on stilts. The group features an oil-can guitar, harmony vocals, a horn section, and a rhythm section. Rowlf can play the full solo piano repertoire, but tends towards music with a jolly, up-beat feel. From birthday parties to functions, Rowlf is perfect for those looking to add a touch extra to their event. From Parisian to Broadway to Pirates and Hollywood, the production comes complete with full themed backdrop/scenery, lighting and PA and are performed by some of the UK's best singers, dancers and speciality performers! Sonic is a one-man entertainment act that's perfect for outdoor festivals and events. Sonic is a one-man entertainment act that’s perfect for outdoor festivals and events. 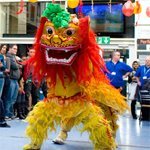 Chinese Lion and Baby Chinese Lion for Children's Parties and Events in London. Chinese Lion and Baby Chinese Lion for Children’s Parties and Events in London. Daniel is a professional balloon entertainer and ventriloquist. He is ideal for children's parties and birthday celebrations. Daniel is a professional balloon entertainer and ventriloquist. He is ideal for children’s parties and birthday celebrations.